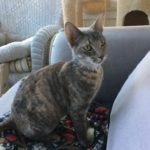 From our friends at Magnificat Rescue: When Diane got Pharaoh, her birthday cat, about a week ago (from Magnificat), she immediately noticed that Pharaoh’s belly seemed slightly rounded. A visit to the vet confirmed her suspicions. 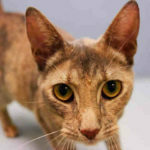 Pharaoh, the dainty cat rescued from the New York City ACC’s euthanasia list and now renamed Cleopatra, is pregnant. Really pregnant. The ultrasound revealed four kittens. The vet said Cleopatra was due in 2-3 weeks. A late spay was theoretically possibly, but late spays can be dangerous. Diana did not want to do that, which we understand. 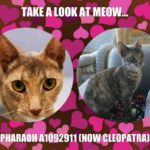 Cleopatra will be spayed once the kittens are weaned. So stay tuned for kitten pictures soon!